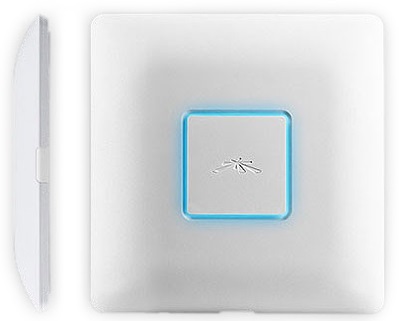 The board design of the UAP-AC looks very clean and compact. Removing the heat spreaders provided a good look at all the main components, which are summarized in Table 1. The table shows that the design sticks closely with the key components used in all first-generation draft 11ac routers. The table includes the D-Link DIR-868L— a second-generation AC1750 class router that I will be comparing performance to later. Note that only the CPU is different. The AC is powered only via 802.3at Power over Ethernet. But Ubiquiti nicely includes a 48V, 0.5A PoE adapter.